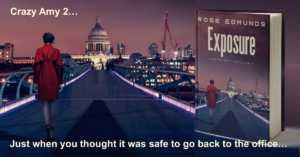 Crazy Amy is back in a new adventure and even before the official launch of Exposure (Crazy Amy 2), bloggers were giving her the thumbs up once more! Who the heck is Crazy Amy? What are people saying about Amy? Lizanne Lloyd is certainly rooting for her. She warms to “her flawed personality, longing for her to find happiness” You can check out her lovely review here Lizanne’s review. Ajoobacats, another prolific blogger, succinctly describes Amy as being “A breath of fresh air from the sanitised female protagonist…” And no one who knows Amy would disagree with that! You can read her enthusiastic review here Ajoobacats’ Review. Terry Tyler believes that “her complex character makes for some interesting relationship dynamics”. Completely – I have very ambivalent feelings myself about Amy, even though she’s my creation! Read Terry’s insightful review here Terry’s review. Finally, Amy has a big fan in Bella from Bestthrillers.com, who admires “the loathing and vitriol that makes Amy so unique among contemporary sleuths”. You can see the rest of Bestthrillers’ awesome review here. Thanks to all these lovely ladies for their reviews and I’ll be posting more soon. As all the bloggers have identified, you don’t need to have read Concealment to enjoy Exposure. For example, Lizanne says it “stands alone as an enjoyable, exciting page-turner”. 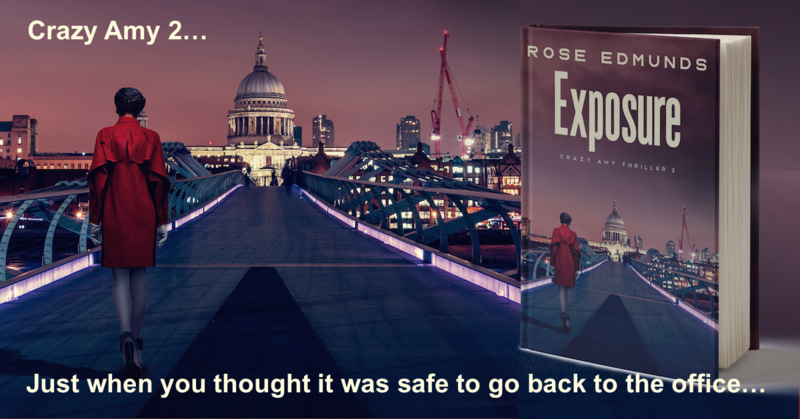 So you can start your journey with Crazy Amy HERE with Exposure if you like, and then return to her gripping back story in Concealment HERE. And of course you can always read the books in order if you prefer! And if you’re really keen to get to know Amy and the other characters of the series, I’m writing a series of background short stories. These are completely free, but available only to members of the Crazy Amy VIP Fan Club. The first one, the Truth, is a prequel to Exposure. It explores 16 year old Amy’s doomed love affair with Toby, who reappears in Amy’s life many years later. You can join HERE and get your story with a just a few clicks. I hope you enjoyed reading about Amy, and feel that it will be worth your while getting to know her better. Do contact me or post on my Facebook page Rose Edmunds Author Page and let me know what you think! This entry was posted in Blog Posts, News & Press and tagged book blogs, book launch, book reviews, nail-biting thriller. Five year anniversary edition of Big Pharma conspiracy thriller now available!